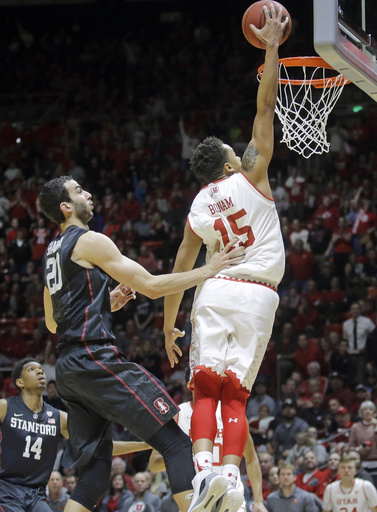 Bonam scored a career-high 26 points as Utah rallied to defeat Stanford 67-59 on Saturday afternoon. “I put my heart into it,” Bonam said. “It means everything to me (to have family here). … To have them drive here from Detroit, they’re crazy. It’s a blessing. In front of them, I felt like I had to show out. The Utes (20-10, 11-7) will go into the Pac-12 Tournament as the No. 4 seed and a first-round bye despite a choppy season. They were picked to finish eighth in the conference preseason poll. Stanford (14-16, 6-12) must wait to find out its seed in the tournament. 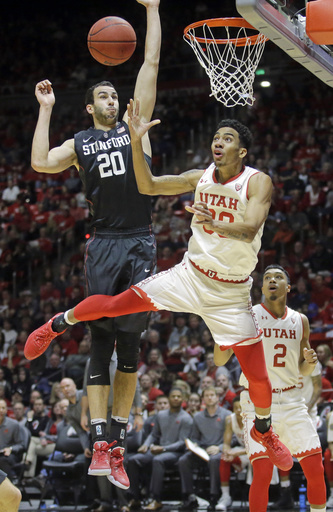 “It was an uphill battle for us,” Utah coach Larry Krystkowiak said. “I talked about it three weeks ago and I think everybody thought I was crazy when I said we were still aspiring to be the fourth seed until somebody tells me otherwise. A few things fell into place from outside sources and we took care of all the business we needed to take care of. Both teams were sloppy throughout, but Bonam took over down the stretch on both ends of the floor to put the Cardinal away. The Utes used a 14-2 run late in the game, including nine from Bonam to take an eight-point lead after trailing most of the day. Bonam had back-to-back steals and layups to go up 62-54. Stanford never led again. Bonam scored 12 points in the final 4:17 and Kyle Kuzma added 16 points for the Utes. “Toward the end of the game, those last five or six minutes, we kind of lost our edge a little bit on the defensive end,” Pickens said. “In the first half, we got up and we were able to do that because we got stops on defense. We were aggressive and in the right spots where we needed to be. We were able to get stops and push in transition. The Cardinal took a 28-26 lead into halftime, but led by 11 midway through the first half. Stanford built the lead with an 11-2 run as the Utah offense was dreadful, missing several layups. The Utes scored just two points during the nearly six-minute stretch. Utah responded with a 14-3 run of its own, highlighted by a pair of 3-pointers from Kuzma and Gabe Bealer, to tie the game at 26. Stanford: The Cardinal didn’t play particularly well despite shooting 53.3 percent from 3-point range. The entire season has been a struggle for Stanford and it now hopes to put together a run in the Pac-12 tournament. Utah: Saturday meant nothing for the Utes after California lost to Colorado before the game even started and the No. 4 seed was locked up. The biggest concern lies with starting center David Collette, who had to be helped to the locker room with an injury in the first half and never even returned to the bench. Krystkowiak said he was hit in the head and they will be careful after he missed time with a concussion earlier in the year. Stanford: The Cardinal must wait for the final standings to find out when it will play in the Pac-12 Tournament next week. Utah: The Utes will play the winner of the No. 5 seed versus No. 12 seed on Thursday in the Pac-12 Tournament.